In March 1939 Antoni 'Joe' Podolski got the news he had been waiting for. He was accepted into the Medical School at Lwow. Joe was then living on his family's 2500 acres estate in eastern Poland about 9 miles from the Russian border. Half of the land was forest full of bears, foxes, beaver, deers and in winter packs of wolves. Frequent visitors to the family home were those who had escaped from communist Russia. They brought tales of genocide and work camps. Joe's father feared another partition of Poland by Russia and Germany and had made provisional plans to move further west to his home town of Mielec. Before that could happen Nazi Germany and Soviet Russia attacked and invaded Poland in September 1939. For Joe Medical School would have to wait. Joe and his scout troop were given the task of looking out for German aircraft. They saw none. They were then tasked with looking out for anything unusual as brief radio transmissions had been detected close by. The scouts found two horses with carts occupied by three men beside the cemetery. A polish patrol checked them out but while doing so were all shot dead. A polish officer ran to assist - he too was shot. Joe and a Polish Warrant Officer came across one of the enemy agents. The WO was wounded but Joe killed the fifth columnist using both a pistol and a rifle. On 17th September Russia invaded Poland. Joe's father went to fight the Russians. He crossed the border into Lithuania but was taken prisoner by the Russians. In captivity he had developed a high temperature and by giving a Russian doctor a silver cigarette case he was withdrawn from the transport taking prisoners away to be executed at Katyn. The Russians arrested Joe's mother and deported her to Kazakhstan. Joe saw what the Russians did to his family's estate. The Russsians chopped down their 600 fruit trees. They destroyed with axes the 400 beehives in the orchard. They blew up the fish ponds containing carp with anti-tank mines. Joe evaded capture and lived in an isolated barn with a school pal. Together they found a camp of arrested men, took cover in a field of flax sheaves and witnessed the NKVD (Soviet Secret Police) execute them. They were shot in the base of the skull. Joe's school pal exclaimed in horror! A rifle shot rang out and his pal was dead. Joe escaped unnoticed. Joe moved into the forest where he joined up with others to form a partisan group 600 strong. They started a campaign of sniping at Russian commissars. They blew up bridges, viaducts and railway transport. In November Joe and a small group of others got into a firefight with Russian forces. Joe using a sniper's rifle managed to kill a number of NKVD before he was captured. Joe was taken to a pre-war Polish prison. There he was interrogated as to why he was in the forest and who he was with. The NKVD put him through a mock execution. He was then put in a cell, designed for six, with 33 other prisoners. After two weeks he was moved to another prison by train. Joe and the prisoner he was chained to jumped off the train in an attempt to escape. They were quickly recaptured. At the new prison the NKVD dislocated Joe's shoulders and elbows. Joe was placed on a packed train of cattle trucks. One of his fellow prisoners was a middle-aged cavalry doctor who had set many soldiers' dislocated joints after they had fallen from horses. He told Joe he must set his joints if he was to have a chance of using them again. Joe passed out several times from the pain during the process. The doctor was later executed by the Russians at Katyn. The train after many days arrived at Orsha. It was Christmas Eve. They were marched to an 18th century monastery which was being used as a prison. He was told the biggest problems in the cells were bedbugs and Russian criminals. He was brought before three NKVD Officers who accused him of counter-revolutionary activities, sabotage and banditry. They sentenced him to execution by shooting. Joe was placed in a cell on death row. As the days went by various prisoners were taken out and shot. After twenty-three days Joe was removed from the cell and brought again before three NKVD Officers. They told him his case had been reviewed and his sentence had been commuted to 25 years hard labour. In February 1940 Joe and other prisoners were marched to the railway sidings and put on board a train of cattle trucks. The train was heading to the labour camps in the Arctic Circle. Joe was removed from the train in Moscow after the chief train guard suspected he was a spy. He was taken to the Lubyanka prison and held there for nine nights. Joe was then taken back to the same train he left and even put in the same truck! The train stopped at Pechora and a group of prisoners including Joe took the chance to escape by dropping through the floor of the truck to the track below. They were spotted by the guards and automatic fire rang out. Thirteen or fourteen prisoners were shot dead. Joe and two companions, Ted and Olekk, managed to hide in the truck of another train which had been loaded with furniture. Eventually the train left and headed south. Joe and Ted left the train near Kotlas after their travelling companion Olekk had been discovered and shot. They found refuge in a village with a former schoolteacher. Her sons gave them skis and showed them a route map to the big lake between them and Finland. They covered 400 kms in eight days and arrived at Vytegra. There they went to a safe house lived in by an ex-prisoner and were given details of a man who would drive a light tractor pulling sledges across the frozen lake. Joe and Ted travelled 100 km across the lake in a sledge and then made their way to the Finnish border. The border was mined. Ted lost his life by setting off a mine which blew Joe five meters away and entangled him in the Finnish border fence. The Finnish border guards rescued Joe by dragging him onto their side of the border. A Polish military attache arranged for Joe to receive a Polish passport and Joe made his way across Scandinavia to arrive in Hull, England, in May 1940. Joe requested to join the Air Force and was sent to a holding unit in Blackpool to complete the selection process. The RAF told him he would be posted to a pilots' school. However in Blackpool he was interviewed by Polish Military Intelligence who initially thought it was Joe's father they would be meeting. From this meeting Joe learned his father had been in Military Intelligence before the war. Polish Military Intelligence took Joe to a country house near London and spent two months questioning him about his experiences in Russia. Joe together with a group of others was "invited" to return to Russia! Eliminate three members of German Military Intelligence. Deliver call signs and morse code to Polish Military Intelligence officers believed to be prisoners in Russia. Joe was taken to Portsmouth and put on board a submarine. 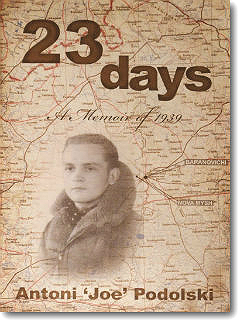 After 19 days he left the submarine on a kayak and landed on the Lithuania coast in May 1941. A Red Army patrol captured Joe after conducting a search of the village he was hiding in. He was taken to the local NKVD HQ where they accepted his explanation that he had escaped from an refugee camp. Joe formed a relationship with a young Russian girl called Natasha who worked in the kitchens in the NKVD compound. Her father was a high ranking civil servant and party member. Natasha was besotted with Joe and was planning Joe's escape from the compound so that they could live at her family's country house. On 22nd June 1941 Nazi Germany attacked the Soviet Union. This led to a great panic at the compound where Joe was kept. The Russians decided to evacuate. The prisoners were put on an overcrowded train which left for Wilno and then arrived in Minsk. Natasha ensured that Joe helped her look after the provisions on the train. She managed to obtain special passes from the NKVD which would enable them to travel on any means of transport throughout Russia. They boarded a train which took them beyond the Ural mountains to Novosibirsk. They left the train there as Natasha had shot dead an NKVD officer who had tried to take liberties with her! They headed south and came across a group of Polish boys. A woman called Zosia was taking them to join the Polish Army which was said to be forming at Kuybyshev. They travelled with them on vastly overcrowded trains and eventually arrived in Sverdlovsk on 25th August 1941. There they made contact with a Polish Officer and travelled by train to the Polish HQ at Buzuluk, near Kuybhshev. Joe was reunited with his father who was also at Polish HQ! His mother also joined them at the end of September. A German agent was identified to be masquerading as a Polish Major at Polish HQ. Joe was asked to eliminate him. Joe shot and killed him together with another German who was with him. Joe's mother manged to get out of Russia with the Polish 14th Infantry division which left for Persia. Joe on 3rd August 1942 travelled by train to the Russian port of Krasnovodsk on the Caspian Sea. There he and Natasha boarded one of the ships and arrived in Pahlevi, Persia. Joe returned to England, arriving in Liverpool in May 1943, having survived the sinking of the ship he was on, the SS Laconia, on route from South Africa to the UK. He went on to fly with the RAF finishing the war in 309 Polish Squadron. Antoni 'Joe' Podolski died in Norfolk, England, in 1999 aged 76. Publisher Yellow Wheel Publishing 2014. This page was added on 25 September 2015.